The recent controversy about the Google Book Search Settlement seems to have taken up peoples’ Google-watching attention so much that advances in the way GBS actually works have been getting overlooked. Several notable improvements were made during the summer, for example, that got very little recognition. Another change that seems to have gotten little recognition is that Google web searches have begun to include links to books in GBS in the last 1-2 years (as in the example at left). Particularly in searching for historical topics, I’ve been seeing searches recently in which the majority of the first 10 hits are from GBS — A great advance, I think, for historical research. Up to now, my experience has been that history has been a fairly weak subject on the Web — Locked away in books, not on Web pages. I had occasion to take advantage of the newly accessible books from GBS recently, when I was least expecting it, while having a discussion with my son David, who’s a long-distance runner, about track runners of the past at the University of Iowa. I remembered that one particular runner on the team, Ted Wheeler, ran on the US Olympic team in the 1950’s, and that he later went on to become the coach for the UI track team (I especially knew about him because while he was the coach he married Sheila Creth, the University Librarian at the University of Iowa Libraries, where I work). David knew that Wheeler had been in the Olympics, and thought that he had been an assistant coach at Iowa, rather than the head coach. So … of course I turned to Google to settle the “discussion.” It turned out to be a surprisingly difficult search. I assumed that it would be fairly easy to find records of recent track coaches at a large, Big Ten program like Iowa. But it wasn’t — I tried several search terms without success before — Bingo! 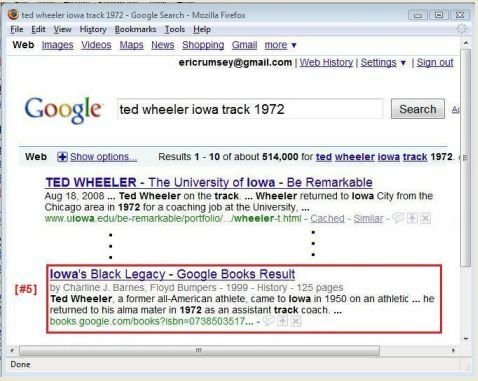 — I finally hit upon the combination that turned up the page shown here, establishing that Wheeler was, indeed, the UI track coach from 1978 to 1996 — with the added benefit of a great picture! The point of this little story: I think integrating GBS links into Google web search is a great advance, and deserves more attention. As I said above, there’s been so much negative press for Google in recent discussions of the Settlement that everything they do is interpreted negatively — I saw a link in the last couple of weeks, that I unfortunately didn’t keep track of, decrying Google’s putting GBS links in Web search results because someone thought Google was trying to unfairly boost their own content. Really?? I think there’s such a treasure in old books that the world will benefit from Google’s making them more accessible. There are questions, certainly, about the algorithm used by Google to determine which books are included in Web search results, and I hope Google will say more about that. But it’s not only Google that’s saying little on the subject — I haven’t seen much discussion at all by anybody on the integration of GBS books in Google web search results — If anyone can find it, please add a comment or contact me by Twitter or Email. Posted in GBS Case Study, Google, Google Book Search, PicsYes, Uncategorized.